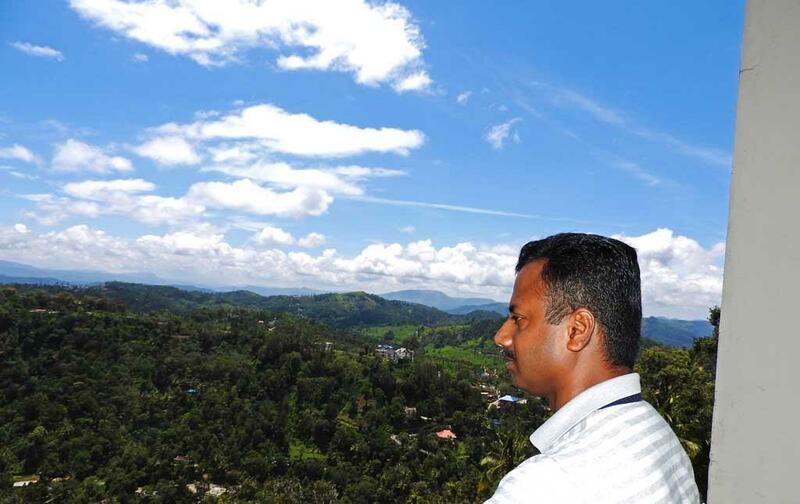 I recently made a visit to the Spice Country Resort in Munnar. Read my experience and review of the Spice Country, an easily accessible resort in a picturesque location in Munnar. 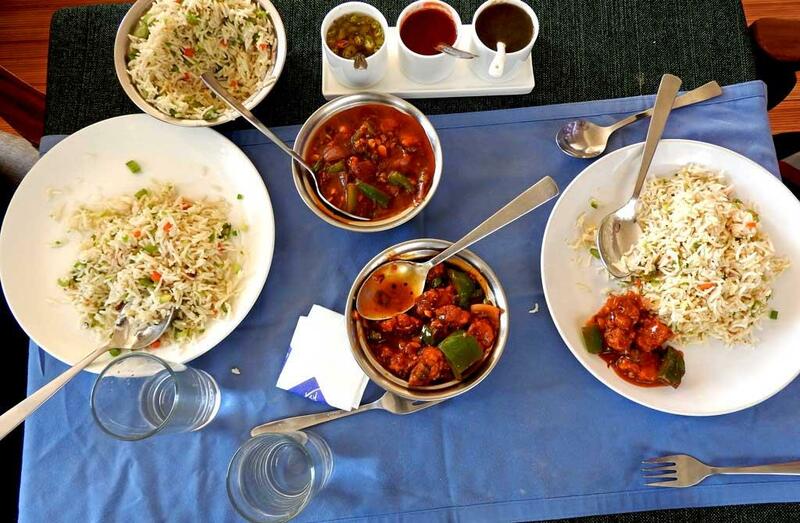 Spice Country is located adjacent to the Kochi - Munnar highway. From the highway, this resort looks like a small two-storey hotel but if you go to the balcony behind the rooms, you will see the huge valley behind the property. Also, you would be surprised to see that this is a 5 storey building, 3-floors hiding below the road level. When you walk down the stairs, you will feel like you are walking down a hill. The beautiful architecture of the resort blends well with the classic surroundings. They have all basic facilities room service, front desk, travel desk, Wi-Fi, security, parking and doctor-on-call. I think every room has a balcony overlooking the beautiful valley. May be they have some rooms behind the lobby without a view of the valley, I am not sure. If you just booked a room, call the hotel and make sure the room allotted to you has a panoramic view from the balcony. The honeymoon cottage is the best one at Spice Country. It is a separate cottage attached to the main building and gives good privacy and excellent view of the valley. It is a dual cottage with 2 rooms, well separated. The view from the balcony of the honeymoon cottage is really awesome. Wake up early, sit in the balcony and watch the rising sun in the early morning. You will fall in love with this place. We were lucky to have a good view of mist slowly rising from the bottom of the valley. Spice Country has deluxe rooms, premium valley view rooms with balcony, family suite with balcony or honeymoon suite. 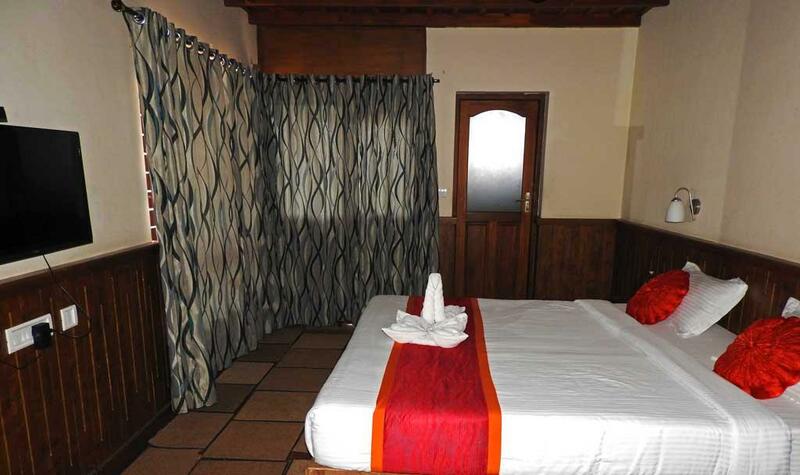 The rooms are spacious, well furnished and fitted with all essential fixtures like writing table and chairs. 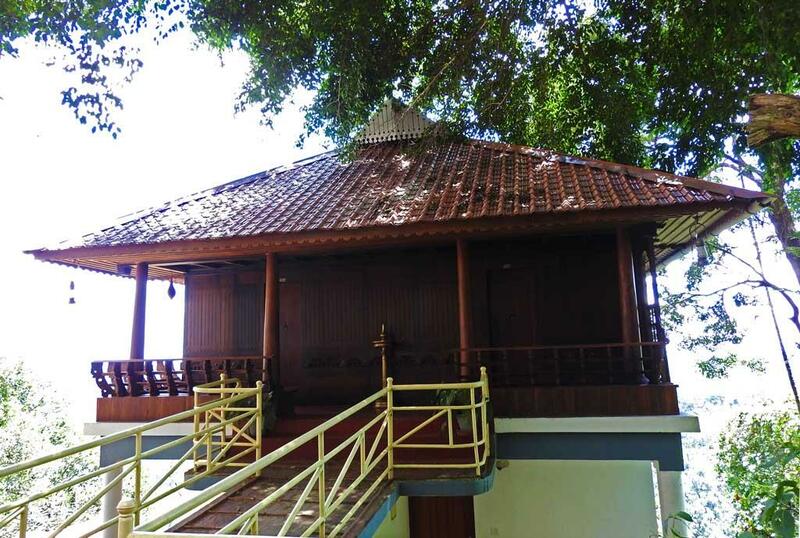 Their honeymoon cottage is a unique traditional Kerala style room with wooden panelled walls and spacious valley view balcony, to make your best days in life memorable. Spice Country, Munnar has a good ambience with an excellent view of the valley through the windows and from the balcony. There are lot of plants and flowers all over the verandas, which gives the feeling that you are close to the nature. The menu has a lot of choices and the pricing is very moderate. We ordered fried rice, chilly chicken and chilly fish for our lunch. The price was quite normal like any other fine restaurants and the taste was pretty good with the right mix of mild spices. The chilly fish was the favourite of all. The restaurant overlooks the huge valley and mountains behind the hotel. They have some seating outside as well which gives a panoramic view of mountains. Spice Country is located in Kochi - Munnar highway, between Anachal and Chithirapuram, about 11 km before reaching Munnar. Anachal and Chithirapuram area have a lot of hotels, resorts and homestays. For the same reason, a lot of tourist activities are happening around this area, which include Kathakali, traditional Kerala art forms, martial arts etc. Check with the hotel and they will arrange a visit to these places. If you are looking for a place to spend your vacation in the middle of nature, on the top of a hill and surrounded by pure and lush green nature, look no further. Spice Country Resort is the place to go. Spice Country is ideal for honeymoon couples, families and small groups. However, if you are coming with a large group of people expecting to have a lot of gala time, this may not be the right place since the rooms are located close to each other, a lot of noise may not be permitted here. TIPS: Ask for a valley facing room in the top floor. The top floor is on the top of the hill but is in the same level as the road and parking, so you don't have to use a lot of stairs. All other floors are below the road level into the deep valley.